Santa Fe High school shooting: 17 year old kills 8 classmates & 2 teachers. Pictured Santa Fe High School shooting suspect, Dimitrios Pagourtzis. Images via social media. 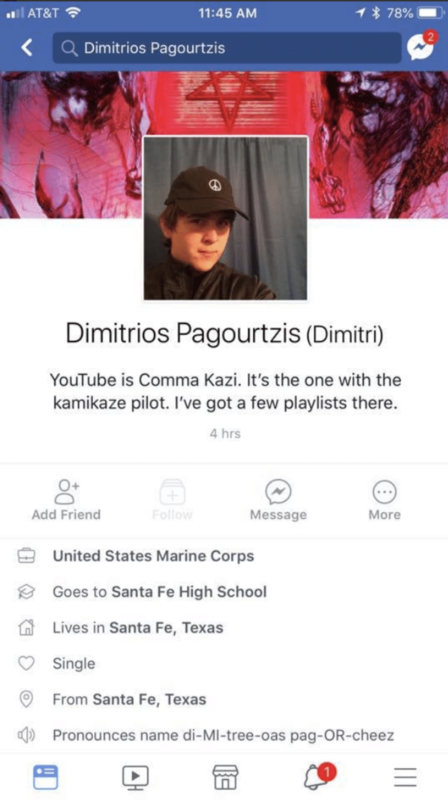 Dimitrios Pagourtzis Facebook & Instagram accounts: Santa Fe High School mass school shooting suspect profile showed clues of teen in rebellion and love of violence. Dimitrios ‘Dimitri’ Pagourtzis a 17 year old Texas boy has been identified as the alleged suspect who shot and killed up to ten fellow students at Santa Fe High School Friday morning. The shooting comes as the student donning a trenchcoat entered a classroom wearing a ‘Born to Kill’ T-shirt, yelling ‘Surprise!’ as he proceeded to fire a volley of indiscriminate gunfire where he fatally shot 10 people, most of them his classmates. Following the school mass shooting, Galveston County Sheriff Henry Trochesset told of Pagourtzis being taken into custody where he was held without bond at Galveston County jail on charges of capital murder and aggravated assault of a peace officer. The teen’s arrest follows Pagourtzis exiting the shooting scene with a pistol by his side while wearing a Make America Great Again cap. The red hat was made infamous by President Donald Trump during his recent presidential campaign and has since become a symbol of extremism, oppression and vilification of minorities and national discord. Along with fatally shooting nine students along with a school teacher, the Texas teen also wounded ten others, including a responding police officer who was reportedly shot in the shoulder. Click2Houston reported the critically injured officer as Santa Fe Independent School District police Officer John Barnes. Following the mass school shooting Chron.com, citing law reinforcement sources reported the gunman carrying out the massacre with a shotgun and a pistol. 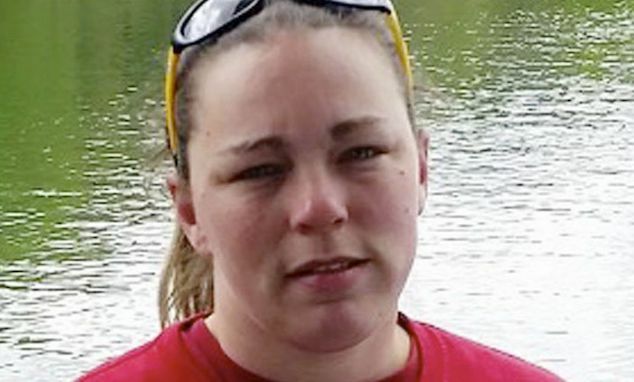 Officials told of the ‘troubled’ student having no prior criminal convictions. Dimitrios Pagourtzis – 17 – was identified as the shooter suspected of killing at least eight people at Santa Fe High School. Dimitrios Pagourtzis: Born to Kill. Clues as to the teen’s ‘destabilized’ state of mind came April 30 when the youth on his now deleted Facebook page shared a photo of a black T-shirt with the words ‘Born to Kill’ printed across the front. 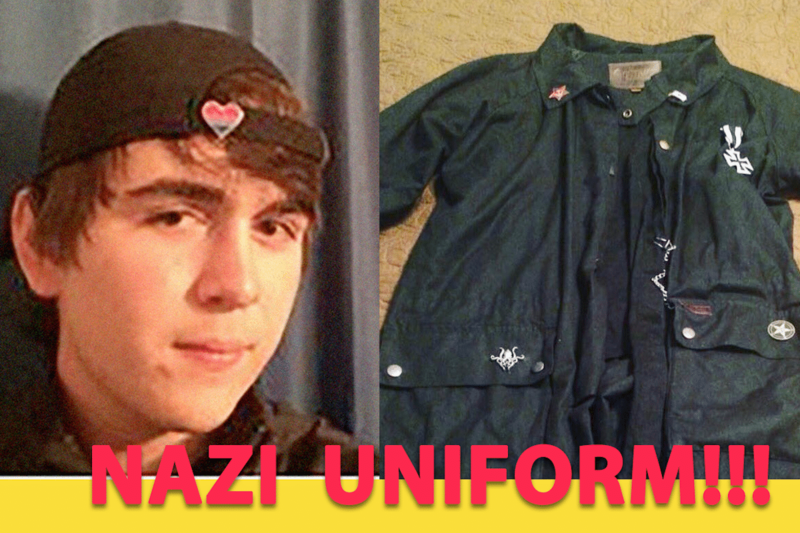 CW39 reported that witnesses saw the suspect wearing that same shirt and combat-style boots. 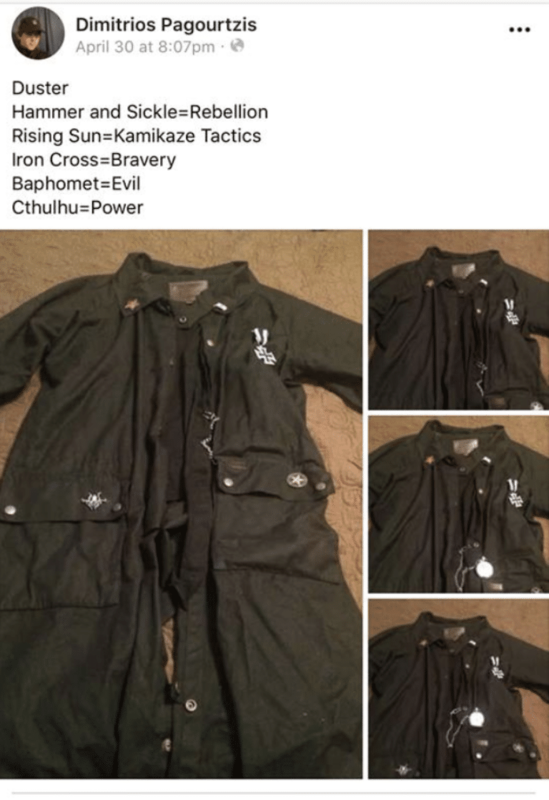 Students remarked the suspect wearing the heavy laden trenchcoat everyday to school despite the oppressive hot temperatures of spring summer months in the region. 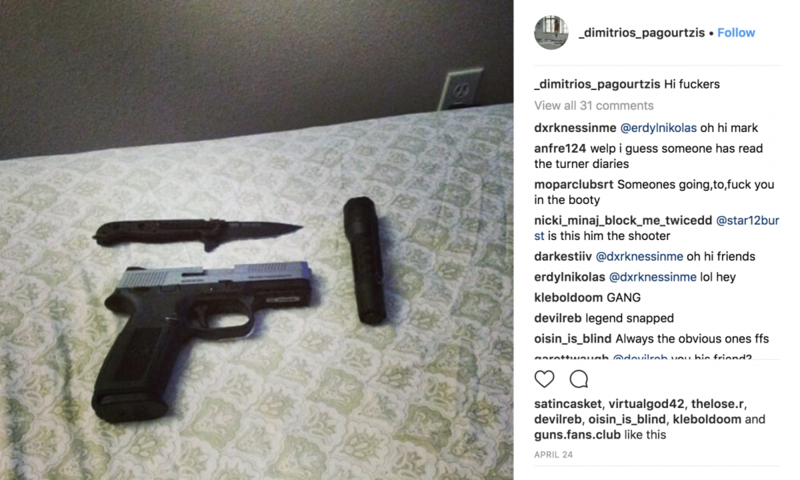 A week prior, a photo showing a handgun and a knife appeared on an Instagram account associated with Pagourtzis. The page has since been taken down reported the dailymail. 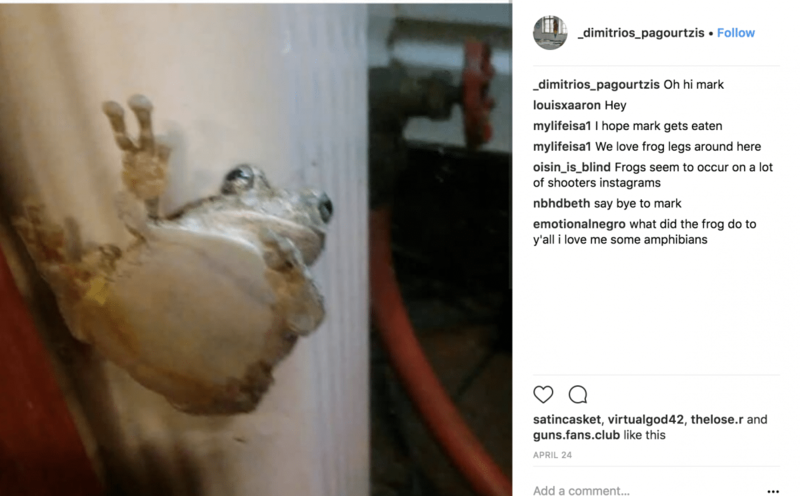 Dimitrios Pagourtzis Facebook and Instagram. Dimitrios Pagourtzis honor roll student who loved guns and simulation video games. Students at Santa Fe High told NBC News that Pagourtzis wore a trenchcoat to school every day. Severin says the teen has been picked on by football coaches ‘for smelling bad’,’ while describing Pagourtzis as someone who kept to himself. Tristen Patterson, 16, a friend of Pagourtzis’, said the suspect had confided in his interested in guns and war simulation video games, while stressing Pagourtzis had never about talked about killing people. Reports told of Pagourtzis playing on the Santa Fe High School junior varsity football team along with being a member of a dance squad with a local Greek Orthodox church. Of note, media reports told of Pagourtzis previously making the honor roll and had been expected to graduate in 2019. 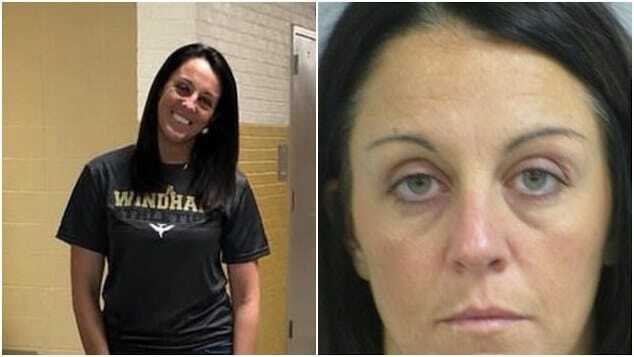 Valerie Martin a language arts teacher who had previously taught the suspect was quoted as saying she ‘saw no signs that Mr. Pagourtzis might do such a thing.’ She viewed the junior as bright, adding he had taken part in the school’s competition for a national history contest. ‘He was quiet, but he wasn’t quiet in a creepy way,’ the teacher said. During a Friday afternoon press conference, Texas Governor Greg Abbott said the suspect used his father’s legally owned shotgun and .38-revolver which he had hidden under his trenchcoat. 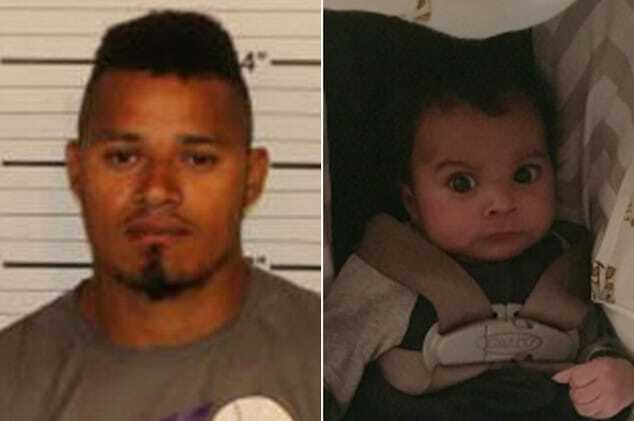 It remained unclear whether the father knew his son had taken them. According to the governor, explosive devices including a molotov cocktail had been found in Pagourtzis’ home, located three miles from the school. Bomb residue and components were also found at a vehicle as well as around the school and nearby. Investigators also swarmed a second home in a neighborhood about five miles away from the school. Officials there could be seen gearing up with battering rams, sledgehammers and saws. 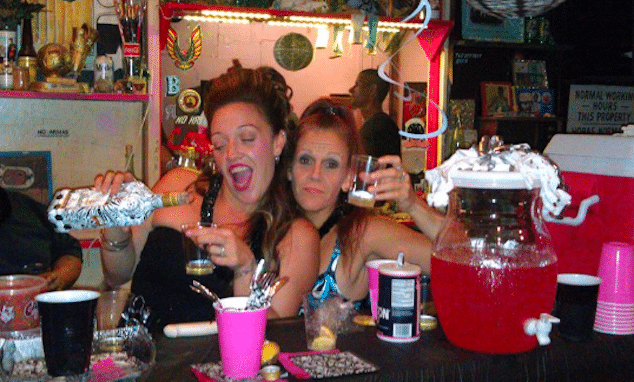 It was not immediately clear exactly how either of those scenes was connected to the shooting. Officials expressed concern that the ‘devices’ may have been booby-trapped. During questioning, Abbott said there were few prior clues about Pagourtzis’ behavior, unlike the shootings in Parkland and the church in Sutherland Springs. ‘The red-flag warnings were either non-existent or very imperceptible,’ he said. Authorities said the teen originally intended to commit suicide, as he had written in journals found on his computer. Following the mass shooting, the teen instead gave himself up, telling authorities that he didn’t have the courage to take his own life. Yes the irony. Dimitrios Pagourtzis shooting: ‘At first we thought it was a fire drill’. Following the shooting, the Santa Fe Independent School District released a statement saying authorities were in the process of rendering the recovered explosive devices safe. It remained unclear how many devices have been found. Dr. Safi Madain at Clear Lake Regional Medical Center says six of eight shooting victims have been treated and released. Madain says one patient remains in critical condition and the other is in fair condition. All appeared to be high school students with gunshot wounds. Other victims have been treated at the University of Texas Medical Branch in Galveston, including a 16-year-old boy and a woman. Dr. David Marshall, chief nursing officer, says one adult male is in critical condition at the hospital. He says that man was shot in the upper arm and is undergoing surgery. Witnesses described how Pagourtzis ‘burst through the door’ of a first-period art class and yelled ‘Surprise!’ before opening fire on his classmates. Another student told ABC13 that the suspect came into her first-period art class and started shooting at 7.45am. ‘We thought it was a fire drill at first but really, the teacher said, “Start running,”‘ the student told the television station. Santa Fe Police, Galveston County Sheriff’s Office and ATF agents responded to the school. Medical helicopters were pictured in the parking lot, along with multiple ambulances. Aware of the fallout that yet another mass school shooting in the US and politician’s unrelenting resolve to impart real change stemming the tirade of violence glibly went on to express his ‘sadness and heartbreak’ and saying that his administration is closely monitoring the situation. Remarks that struck many as dense and without significance. ‘This has been going on too long in our country – too many years, too many decades now,’ he went on to say. ‘We grieve for the terrible loss of life and send our support and love to everyone affected by this absolutely horrific attack to the students, families, teachers and personnel at Santa Fe High. ‘We’re with you in this tragic hour and we will be with you forever. My administration is determined to do everything in our power to protect our students, secure our schools, and to keep weapons out of the hands of those who pose a threat to themselves and to others. ‘Texas has seen too many of these,’ Cruz said. Both Trump and Cruz are staunch supporters of the National Rifle Association (NRA) and have resisted attempts to tighten gun control. Of note, Texas has some of the most permissive gun laws in the U.S. and just hosted the NRA’s annual conference earlier this month. In the run-up to March primaries, gun control was not a main issue with candidates of either party. Republicans did not soften their views on guns, and Democrats campaigned on a range of issues instead of zeroing in on gun violence. In late February, the school was briefly put on lockdown over ‘popping sounds’ thought to be gunshots that were heard outside. Police arrived on campus to investigate but no threat was found. Friday’s tragedy marks the 16th school shooting in the US since the beginning of the year according to a Washington Post database. More than 214,000 students in the U.S. have experienced gun violence at school since the 1999 massacre at Columbine High School, where two students — dressed in trenchcoats — murdered 12 classmates and a teacher before killing themselves. A prayer vigil for the victims of Friday’s shooting has since been confirmed for 6 p.m. at the Texas First Bank at 12402 Highway 6 in Santa Fe.